Welcome to the news roundup for the last week of June, and also the last update until August as industry news tends to slow down dramatically during the holiday period in Europe and particularly during the month of July. Key news will still be posted on the Website when available, along with Laurel Brunner’s Verdigris Blogs. There are only two events that I am aware of in July. FESPA Africa, which kicks off at the Gallagher Convention Centre inJohannesburg this week, from 2 – 4 July; and then Expoprint Latin America in Sao Paulo, Brazil from 16 – 22 July. The next big one for Latin America will be FESPA Mexico in Mexico City from 21 – 23 August. This year’s key event for the newspaper and publishing industry will be WAN/IFRA’s World Publishing Expo which returns to the popular venue of Amsterdam from 13 – 15 October. Don’t miss today’s news from WAN/IFRA. Key news to look for this week includes Antalis with educational podcasts offering advice on aspects of digital and sign & display markets; and also from Esko on Wednesday, relating to the rollout of its Knowledge Base Website, which provides access to valuable hardware and software information, resulting in customer self-service support having increased 75 per cent in less than half a year. Kodak’s announcement on Thursday of its entry into the corrugated market with its latest Flexcel NX developments, including new plates and a new platesetter to address this important market segment led the news. And leading the headlines today you will find a joint announcement from the European Rotogravure Association; IDEAlliance; the Nordic Offset Printers Association; Print Process Champions Group; and WAN-IFRA, as they confirm global cross-industry collaboration for the production of the next industry ‘Best Practice Guide’ entitled ‘Optimized Paper Handling & Logistic s’. As for recent sales and installations, the past week has seen several key announcements, led by EFI and GLS on Monday with the first EFI Jetrion LED inkjet narrow web press in the United States; followed by KBA at Chesapeake/MPS in the UK with a Rapida 106 as part of a £3m investment programme. Also Horizon with another StitchLiner from IFS in the UK. 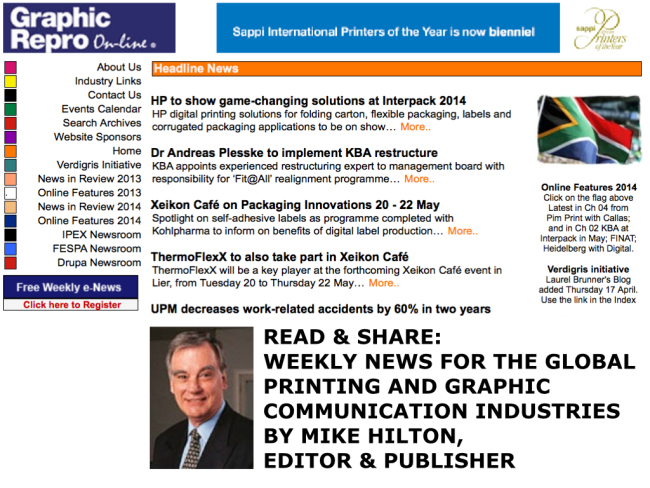 On Tuesday, leading the headlines: KBA again with a third and fourth Rapida 106 now heading for Stora Enso Inpac in Guangdong, China; and from Kodak with Panther Graphics adopting a Kodak Achieve platesetter and Sonora XP Process Free Plates to boost its ROI, as well as its environmental credentials. This was followed by Karl Knauer in Germany, which is now focusing on higher performance with its new Speedmaster XL 106-6 with dual coater. Why settle for a one-size-fits-all UV solution? The Graphic Repro On-line Website is supported and sponsored by:Antalis South Africa, Dainippon Screen, Drupa 2016, EFI and EFI Vutek, Esko, Epson Europe BV, FESPA. Goss International Inc, Heidelberger Druckmaschinen AG, HP Graphic Solutions, Kodak, Koenig + Bauer AG, Kemtek Imaging Systems, Konica Minolta, Krause-Biagosch, Leonhard Kurz Stiftung, Manroland Web Systems GmbH, Muller Martini AG, POLAR-Mohr, QuadTech Inc, Quark Inc, Ricoh Europe, Sappi Limited, Sappi Printers of the Year, Print Process Champions Group, Thunderbolt Solutions, and UPM-Kymmene.If you would like to send news for consideration for the Graphic Repro On-line Website (ISSN 1814-2915) or to submit comments, please e-mail Mike Hilton at: graphicrepro.za@gmail.com.